Birzeit University, represented by its Board of Trustees, president, faculty, staff and students, are deeply saddened by the news of Karim Ajluni’s passing last Wednesday, 16 January 2019 in the United States. He was a great supporter and friend of Birzeit University and its students. In 1989, Ajluni established BZU Fund USA and was the first to chair its board. He and his late wife Suheila supported the university’s main library. 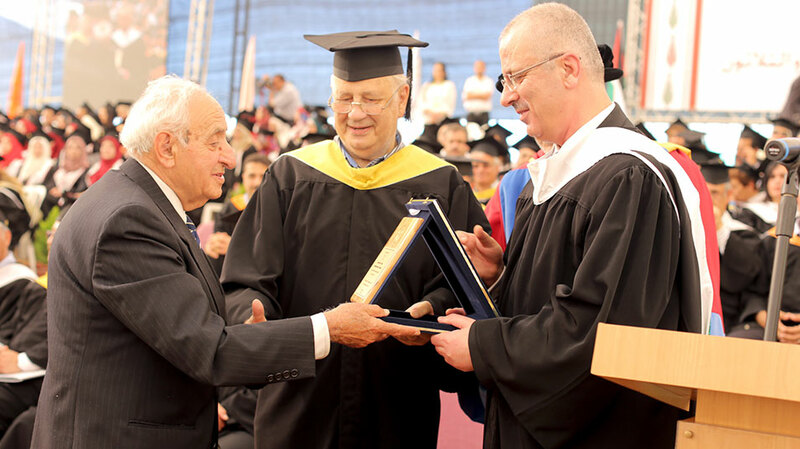 In its 39th commencement ceremony in 2014, Birzeit University recognized Ajluni for his great contributions to Palestine while he was in diaspora, and offered him Birzeit University’s honorary award. Ajluni was born in Ramallah, Palestine in 1929. He immigrated to the United States where he studied and worked in law. He helped and supported the Arab and Palestinian communities in the U.S.